JEFFERSON CITY – The Missouri State Senate’s Health and Pensions Committee heard legislation this week that will help the estimated 1 in 7 new moms experiencing symptoms of postpartum depression. 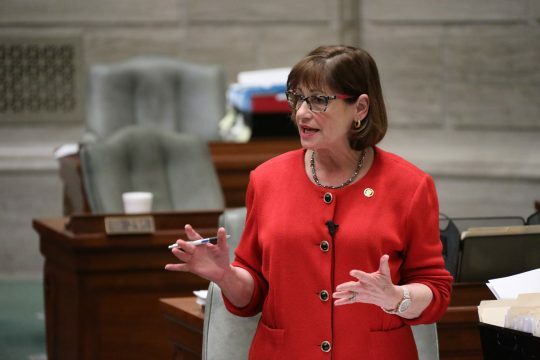 SB 263, sponsored by State Senator Jill Schupp, D-District 24, comes as the federal Food and Drug Administration (FDA) recently approved the first-ever drug treating postpartum depression. Research has shown that postpartum suicide is the second-leading cause of death for new moms. Schupp shared that a significant contributor to the statistic is suicide, but the deaths are preventable and the “underlying issues” are treatable. “This legislation can help keep new families healthy and safe,” she said. SB 263 would require that certain health care providers give information on postpartum depression to new parents as well as offer voluntary screenings for new moms. The screenings would talk place during their regularly scheduled well-woman and well-baby check-ups following pregnancy. In addition to the bill, women who screen positive for postpartum depression will then be able to receive access to the necessary treatment. MO HealthNet offers benefits for pregnant women would extend 60 days postpartum up to one year for the mental health services. Tiffany Farchione, M.D., acting director of the Division of Psychiatry Products in FDA’s Center for Drug Evaluation and Research, shared that women experiencing postpartum depression may experience thoughts of harming themselves or their child. It can also interfere with the maternal-infant bond. As of Thursday, SB 263 is up for a committee vote.